Once again the library strikes again for classroom inspiration! The little guy and I had the treat of going to Latin Grammy nominated bilingual children's concert with the great Mister G. If you are an #earlylang Spanish teacher or a parent trying to keep it bilingual at home then you must check out Mister G's Youtube & website. His songs are appropriate, catchy and entertaining. I know we plan to be rocking out at home this summer to some Mister G. Here are a couple of my favorite songs. A catchy fun song in Spanish about Chocolate that would be perfect for a food unit. A bilingual song with a cute animated video showing the words in Spanish. Have you heard of Mister G? What are some of your favorite children's artists in Spanish? Exactly 1 year ago I posted 10 things I Learned my 1st 2 Years Teaching. Now that I have year 3 under my belt I am going to add a few more to the list. Everything on my original list below is still true. Have Balance in your life. Reflecting on these, this year I listened to my Spanish IV when they were burned out on choice homework and needed a break. 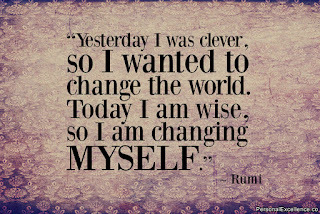 I had to be flexible when I did not have a class schedule until the first day of school. I have grown to network with so many more teachers around the world, who have pushed me to be better. I still need to work on having balance, because if you ask my husband says teachers NEVER stop working (true). I have had my share of failures this year (stubbornly not turning on the subtitles, giving up on a rowdy class & not being prepared to name a few), but each one taught me a valuable lesson. I laughed and made a fool of my self, while also staying much calmer than years past. I baby stepped my way into having novels as the center of my curriculum and do not plan on turning back. I need to work on asking for help, but I had a ton of fun with a group of students I will really miss. It is ok if you realize that you spent your whole first year teaching wasting everyone's time with outdated grammar drills and workbook pages, just as long as you adapt and positively move forward. There will be many things you chose to change on your own, and many adaptations that will be forced on you by the administration. You just have to learn to just roll with it and not take things too personally. Programs and fads in education will keep coming in and out, so just learn how to out a smile on your face and make the best out of every situation. Embrace Phones & Social Media. As I recently posted Snapchat is not the enemy, but this also applies to Twitter, Instagram and phones in general. I have learned that is you build a trusting community where everyone is treated like an adult everything works out a lot better. Instead of disrupting an entire class and lesson by "catching" a student texting, allow them to ask you when there is downtime if they can text their mom that basketball practice has been cancelled. Am I perfect at this? No. With the more open policy I get ticked off if students choose to not ask and hide like they are doing something they are not supposed to. Before we were 1:1 I TOLD students to bring any and all devices to class to use for Kahoot and other Internet activities. If you are a gafe school where students have gmail accounts, you need to use Google Classroom. It is very user friendly and makes students turning in assignments so easy as a teacher. In just a year they have listened to teacher feedback and made many improvements. I know that as a first year teacher many of my plans were week by week, day by day or even hour by hour. If possible try to sit down and roughly plan out an entire unit at a time, with the end goal in mind. I have an example here of one unit. It is so much easier to move forward when you have a roadmap and destination in place in advance. Whenever possible give students a voice and choice in their learning. Whether it is choice homework, allowing them to do individual novel study, or the opportunity to pick their final exam, students flourish when they are in the drivers seat. See all my posts here for student choice. It can be as simple as allowing each class the option of how they want to read chapter 2 of a novel: alone, in pairs, or as a class. If you ask for feedback on what they want to do, students know you care. Present at a conference. Start a blog. Do not think for a second that as a new teacher you are not capable enough to share what you know. It is scary, but so is anything in life that is worth doing. No one expects you to be an expert in your field, but you have a unique and fresh voice that we would love to hear! Along with putting yourself out there, write a grant to earn money about something you are passionate about. I decided I wanted to shift away from the textbook and create a classroom library, so I wrote and received three grants in two years to do so. Someone asked me if I was told to write these by high ups. No. It was something I was passionate about and wanted, so I decided to make it happen. What is the secret? Just Write It! I know this is the opposite of the baby steps above, but sometimes you have to plug your nose, close your eyes and dive off the high dive (or in this case speak Spanish 90%+ of the class). Maybe you will not dive into something new your first year teaching, but isn't the whole first year basically a series or dives, belly flops and flips off the high dive?! Is it terrifying? 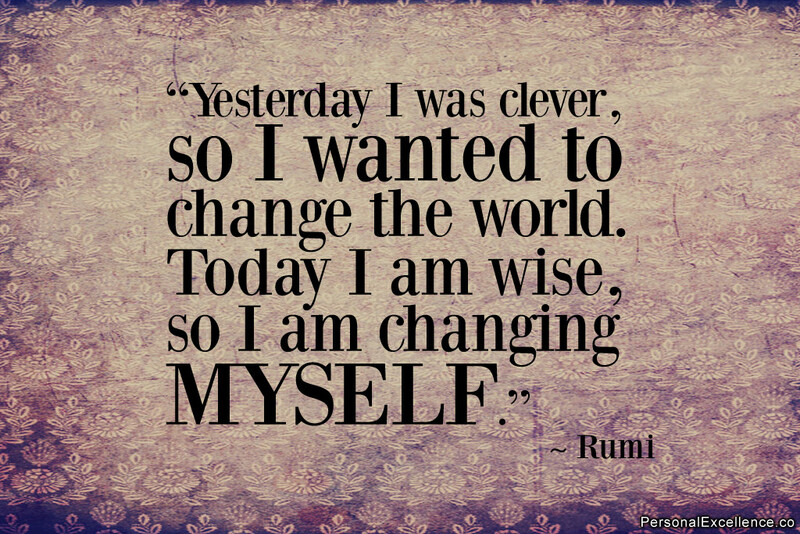 Absolutely, but sometimes if you are going to make a major change, there is no slowly sliding in. As teachers we are 110% committed to our job. We spend out nights, weekends and summer prepping, planning. and buying things to make our class the best ever. Yet, if you commit 110% all the time you will burn out pretty quick. Find something that you can do to get away, whether it is reading, crafting, running or if you are link me, vegging on the couch and watching Netflix with my hubby after the little guy is in bed. Getting away with Olivia Pope, Piper Chapman and Kimmy Schmidt may not be an all inclusive resort, but it is a break from teacher life. If you get to a point that you are no longer being challenged professionally, it is time to move on. Do what is best for you and your family and do not let anyone or any job hold you back. It is tough to start over, but that is how you learn and grow. 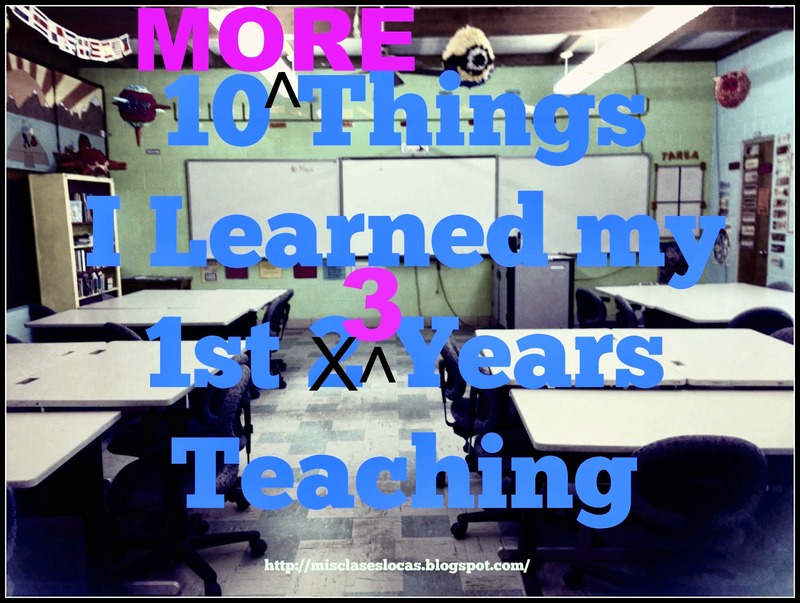 What did you learn your first years teaching? Please share in the comments! 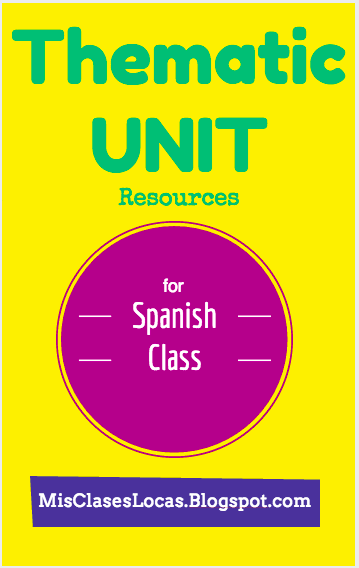 I also created a new page that has links to ideas organized by unit. 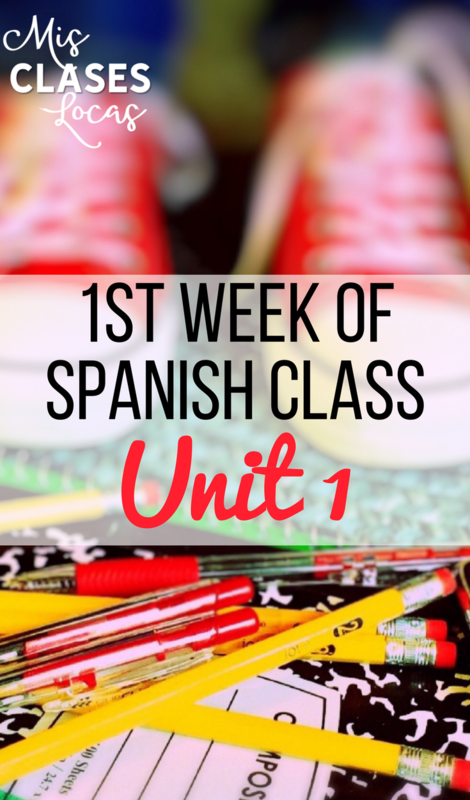 Many of these particular units I do not specifically teach anymore, as they are combined into bigger novel units, but I hope the resources can be of some use to you. 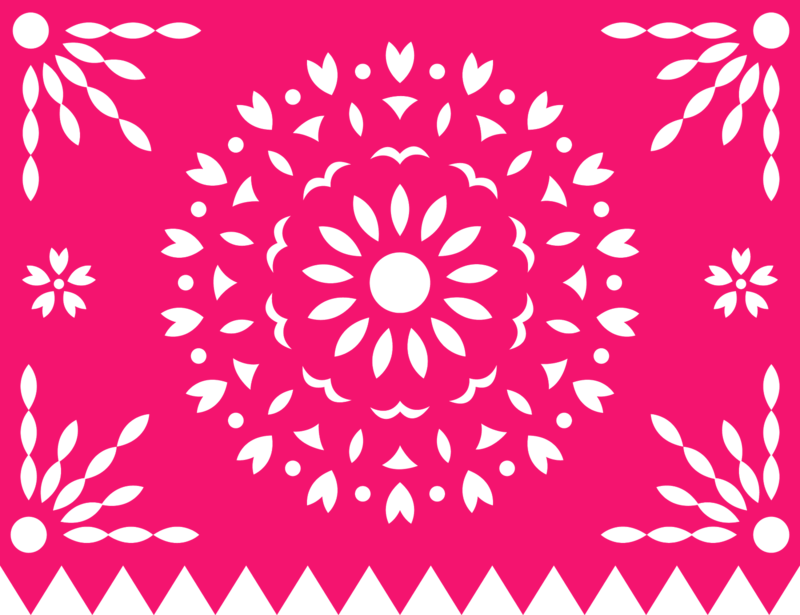 It includes resources for the following: food, sports, the environment, immigration, clothing, school, and many holidays such as Day of the Dead and Christmas to name a few. To make them a full thematic unit, you could move from the topic of food to hunger around the world. If you have other ideas of was in which you would like to see posts organized, or anything you would like me to post about while I have time this summer, please let me know! Here is the link to the new page Posts by Thematic Unit. 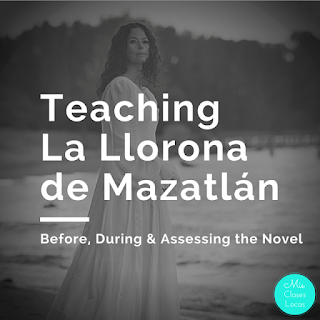 This past year Spanish III spent most of fourth quarter reading La Llorona de Mazatlán by Katie Baker. A large majority of what we did was from the amazing teachers guide by Carrie Toth. Some of the main cultural elements that can be expanded from this book are México, fútbol y leyendas. Since this particular class had spent a large amount of time on soccer the year before with a World Cup unit, we decided to focus more on legends instead. The supernatural legends fit nicely with our Friday watching of El Internado. If you are looking for soccer resources, check out all of these by Zachary Jones. 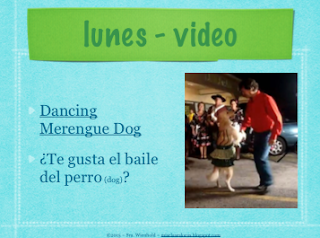 I happened to be sick the first day of the unit, so instead of starting like I had planned, students completed this La Llorona activity by Martina Bex. It was originally designed as an assessment, but worked great as a sub plan, where students read about the legend and answered questions. It gave students a good overview of one version of the legend, which could later be compared with the legend as shared in chapter 13 of the book. 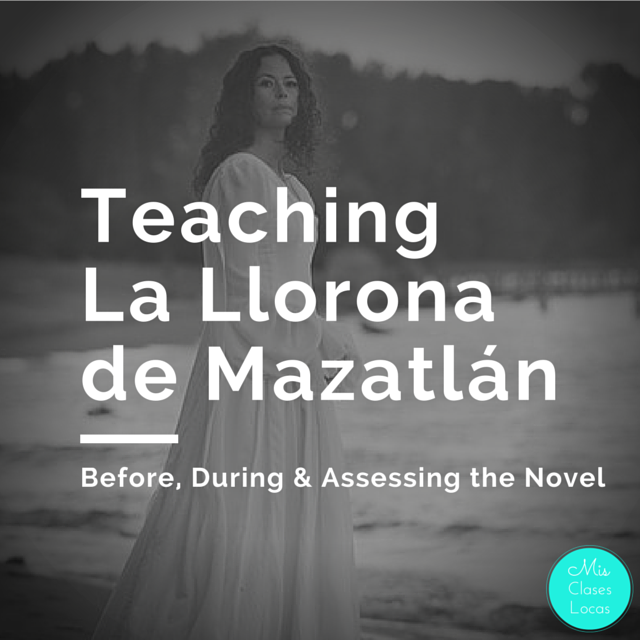 For introducing the novel and the first two chapters, I used a lot of Señorita Barragan's ideas which can be found here. This included using :30-1:10 of this video as a teaser. We also watched the trailer for the animated La Leyenda de La Llorona. The complete movie can be found on Netflix if you wanted to use it as a part of your unit. I gave it as an option, but they chose to watch El Internado instead. Since it was my first time teaching the novel I honestly did not come up with much on my own and used pretty much everything from the amazing teachers guide. 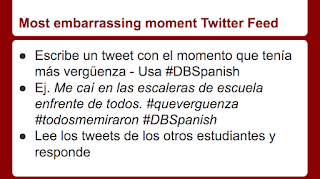 One entertaining activity that was prompted by an idea in the guide was having students tweet about their most embarrassing moments (after the main character gets hit in the head by a soccer ball during her big audition in chapter 6). 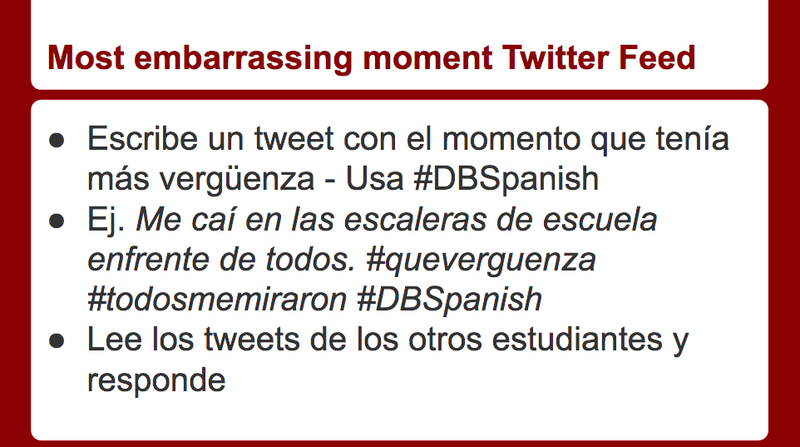 Instead of having a written feed on the wall, they logged into their Spanish Twitter accounts online and started tweeting! They not only had to tweet about their embarrassing moments, but searched out class hashtag to read and respond to their classmates. It was a fun way to end class with students interacting with each other in real time interpersonal writing in Spanish. I also suggested that other classes read through and respond to their funny moments as well. 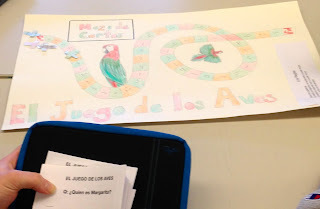 Presentational Writing - Students wrote a book review in Spanish describing what happened using examples, what they thought of the book and if they would recommend it. Most enjoyed the book, but wished there was more action and more to do with the legend of La Llorona. Many had interesting suggestions about which characters they would have liked to see more of and who they believed should have ended up together romantically. There is a lot of teenager dating drama, which many students could relate to. Interpersonal Speaking - In random pairs students came back to my desk and just talked about the novel, asking each other questions as if they were in a book club. 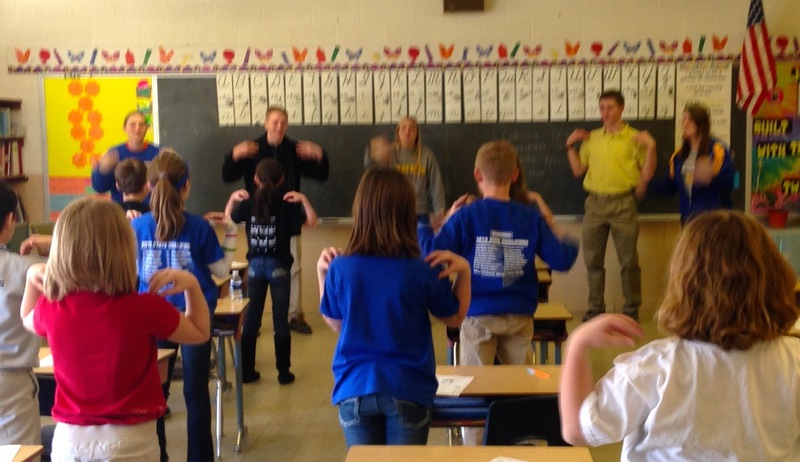 Their goal was to dig deeper into the novel while performing at Intermediate-Mid proficiency. Those who had thought of questions in advance were obviously more prepared and successful at asking questions, but they still had to negotiate meaning and respond to unknown questions. I have also done this type of assessment where pairs or groups talk and I just circulate around the room listening. If time allows, pairs is definitely preferred. Have you taught this novel? What are some resources you can not live without? 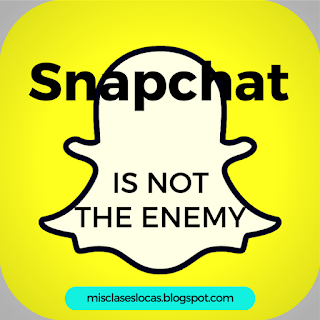 Snapchat is not the enemy. There I said it. I have known that Snapchat was a touchy subject in school ever since the first faculty meeting where Snapchat was brought up as a bullying-naughty picture-must be stopped social media. At the time I had a dumb phone, so I did not get it either. Then my nieces made me get it and know I love sending and receiving quick pictures and videos that do not eat up my phone memory. According to Pew Research Center 41% of teens age 13-17 use Snapchat, but at my last school I would bet it was closer to 75%. "Snapping" is even a new level of dating, (first we were just snapping, then we were "talking" and now we are dating). I know social media platform's popularity comes in and out, but Snapchat is one I see sticking around for a while. 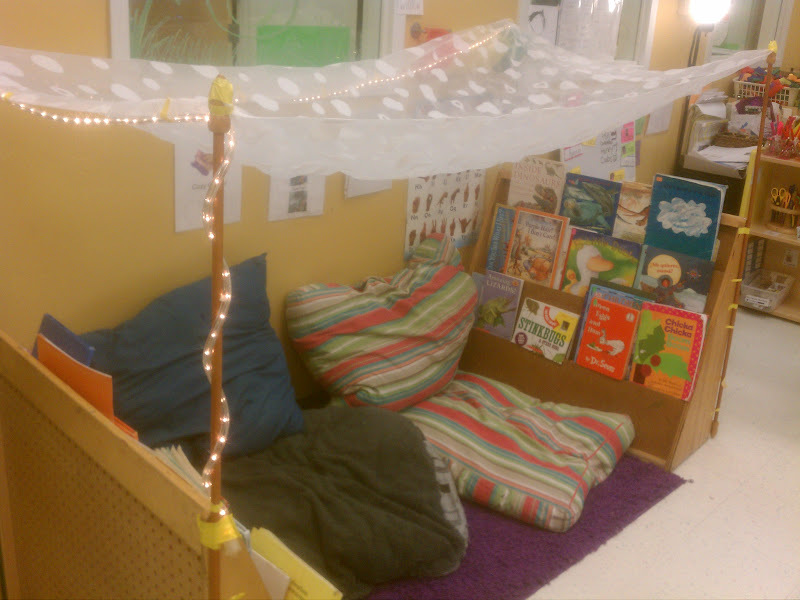 The students LOVE it, so I finally decided to stop fighting it and embrace the possibilities. (Phones are technically not supposed to be used, but I allow them for education purposes or if they ask to use it quickly to take a picture). 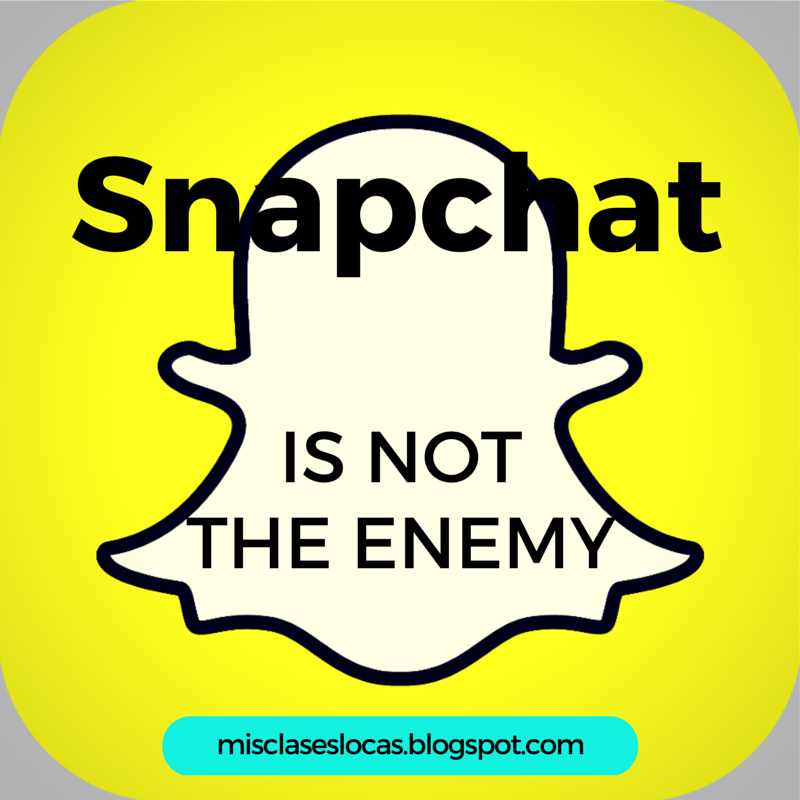 Here are a few ways Snapchat has helped or been used in my classroom. I love it when students come in telling me about how they watched Feria del Abril, Barcelona, Día de los Muertos, or other Spanish speaking countries or events on their Snapchat story. I remember another Spanish teacher screenshotting the Día de los Muertos story, putting it into a slideshow, and using it to prompt discussion in the target language. 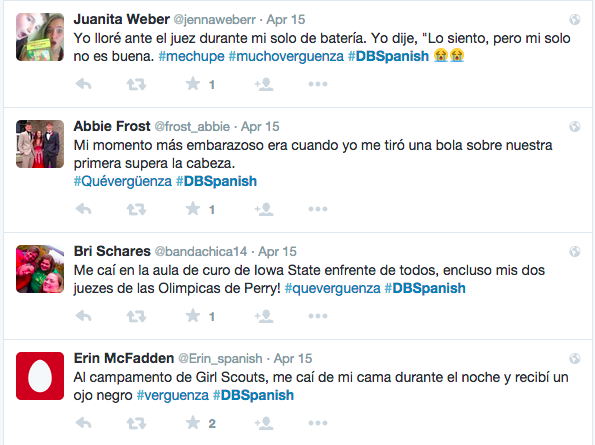 Anytime I can get students expanding their knowledge of the Spanish speaking world, on their own, outside of class, I consider it a win. Have you ever had students run down the hall to your class because they are excited about what they get to do in your class?!? I have and it is the best feeling. Students see their friend posted a video of their class doing the VIERNES chant, so they come in pumped up to post one that is louder and even better! I figure that if something great happens in class, I pull out my phone and take a picture. Why not allow students the same courtesy? (I just ask that they ask first to get out the phone to take a picture). Do you want to be the class that students sneakily tweet how bored they are, or the class that is doing such fun things that they can not wait to share it with their world? Snapchatting in Spanish has quickly become a popular option for choice homework. 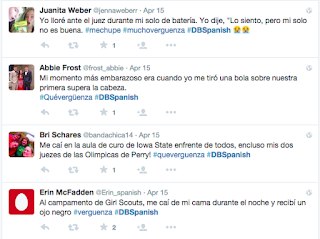 Instead of just texting, tweeting, or messaging each other in Spanish, they can now "Snap" each other in Spanish. 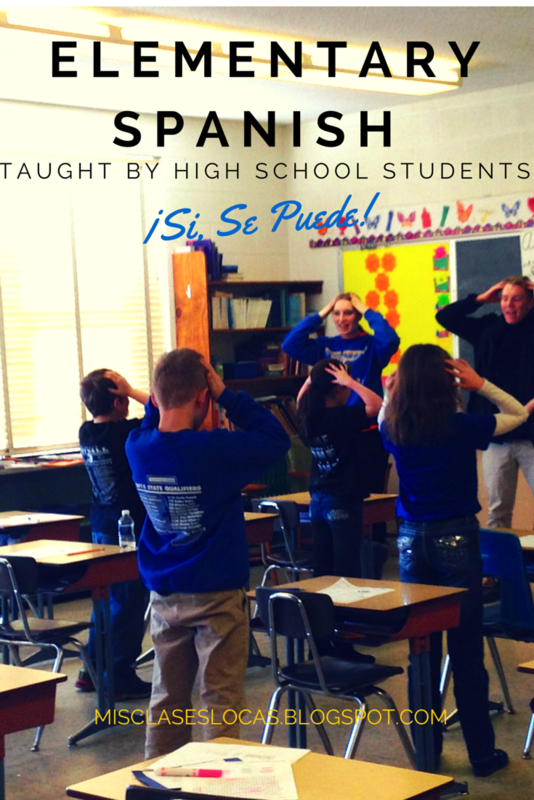 Since may students enjoy this form of communication, why not let them use it to practice their Spanish. However be warned that you will see a lot of ridiculous selfies when they show you their conversation! Allowing students to take photos and videos of their class helps to build a strong class family community. When it is a student's birthday it is tradition in class to sing to them in Spanish while they wear the birthday sombrero. The birthday student and others always ask to take photos and videos of the occasion. It is one of the simple ways that we can celebrate students and make them feel special. Students' Snapchat story describes what is important and valued to them. 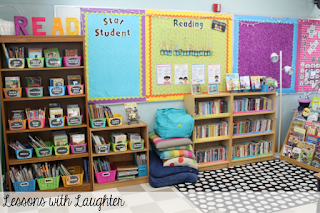 Don't you want your classroom to be an important part of their life story? Have you used Snapchat for educational purposes? How? I would love more ideas! 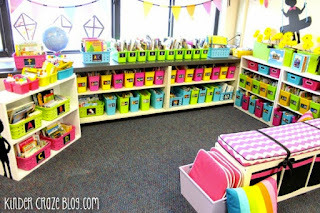 Since I will be starting over in a new classroom, I feel like a first year teacher, pouring over new ideas of how to set up and decorate my classroom. I am going to try and follow some of the advice in this article, which talks about research based reasoning for how to set up a highly effective classroom. 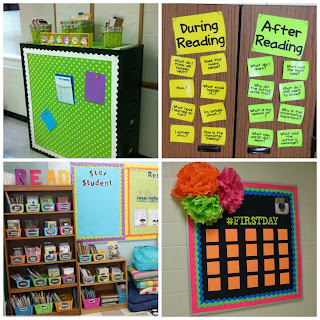 Some of her suggestions are to decorate your classroom like you would your home, with pleasing sounds, smell, homey touches, and clutter is put away. As you can see from the tour of my 1st year classroom, my last room, was as you could say BOLD. The new room will already be toned down as I can not paint it, so it will be white with a brown stripe. It is going to kind of kill me that I will not be able to get into it until August, but it means I will probably have all kinds of plans for when I can finally get in there. Here is some of my inspiration from around the web. This year I have two matching file cabinets and I plan to put them back to back and cover the front with fabric and a border. It will be perfect behind my desk for announcements, schedules and other items to post. Lately I have been obsessing over how I am going to organize my growing classroom library. Here are a couple pictures that have been inspiring me. (Even though most are for elementary :) I am on the look out for more shelves and bins to organize, and comfy chairs and pillows to lounge. 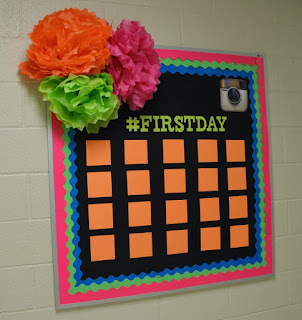 This would be a fun bulletin board to have with the class hashtag. From my experience having printed pictures is a rare luxury to high school students and they LOVE seeing pictures of themselves posted in real life. I may make some reading questions like this in Spanish to help students come up with questions to analyze a text. 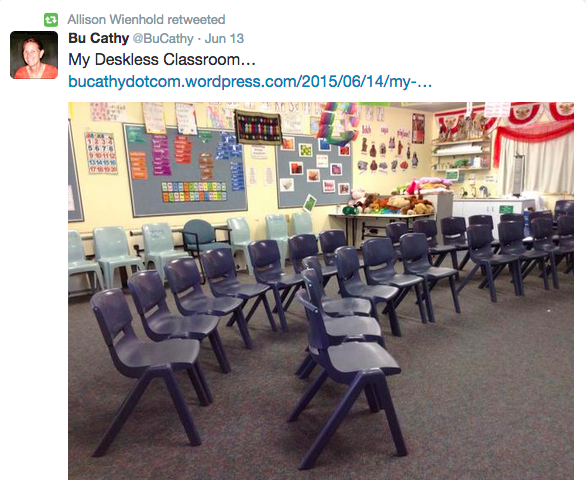 Thanks to Grant Boulanger, Bu Cathy and other's reflections on teaching without desks, I am seriously considering at least just trying it out. I love the idea of the freedom and possibilities for a storytelling class. 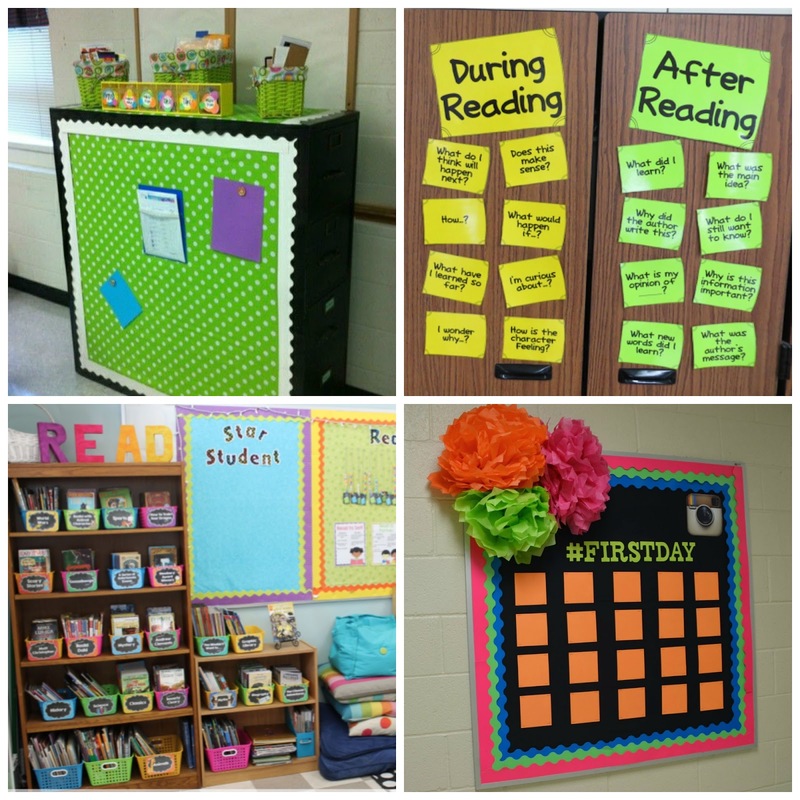 What are you planning on for next year's classroom? Today I went to a great kid's storyteller program at the local library with my little guy. It was with children's book author David LaRochelle. We went as just an activity on this rainy day and I did not have any intention of leaving with a teaching idea, but of course I did! It was awesome to see a master storyteller, even though in English, in action. He had his audience captivated, even with a wide variety of ages. The children were involved, as he elicited responses, allowed them to be silly and move, and kept things engaging and moving from one activity to the next. One activity of his that I would like to share I will call Storytelling with numbers 1-10. He started his presentation with this engaging demonstration that would be perfect for any level of foreign language class. Tell the group you are going to draw them a story. Starting with #1 draw each number into a picture while telling a story. His started with a monkey who could not read, and then the monkey proceeded though kites, helicopters, Abe Lincoln and Saturn. This could be used to retell a class story, or create an entirely new one using student feedback and story asking. I could see this activity being used in many ways in the classroom. Here are just a couple ideas I came up with. All students are given a piece if paper with large 1,2,3,4,5,6,7,8,9,10 written, and they must illustrate and then write a story. I created a simple worksheet here, that would work well as a sub plan or fast finisher activity. Students are given a story from class and then must illustrate that story into the 1-10. 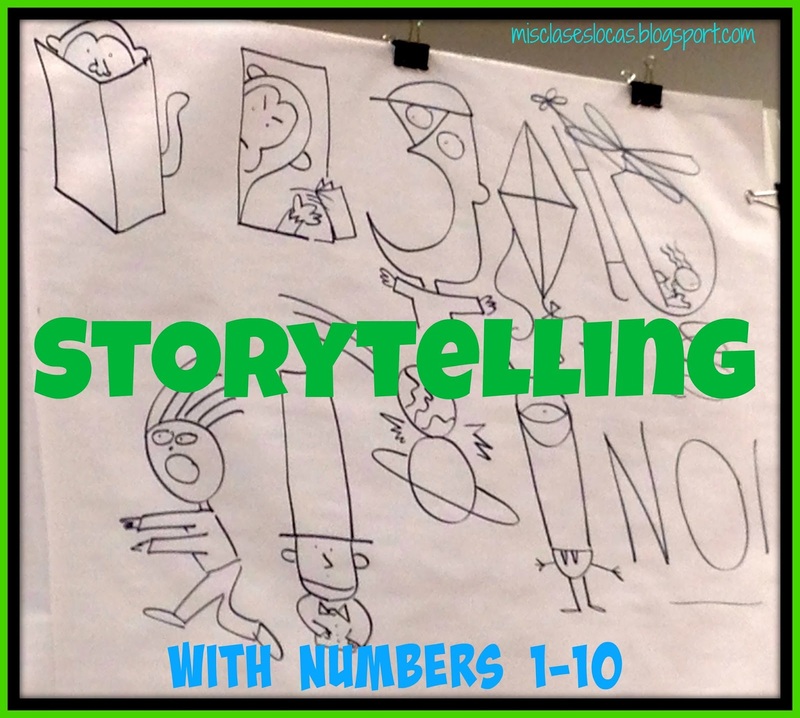 In partners one student tells a story and the other must illustrate into the 1-10. 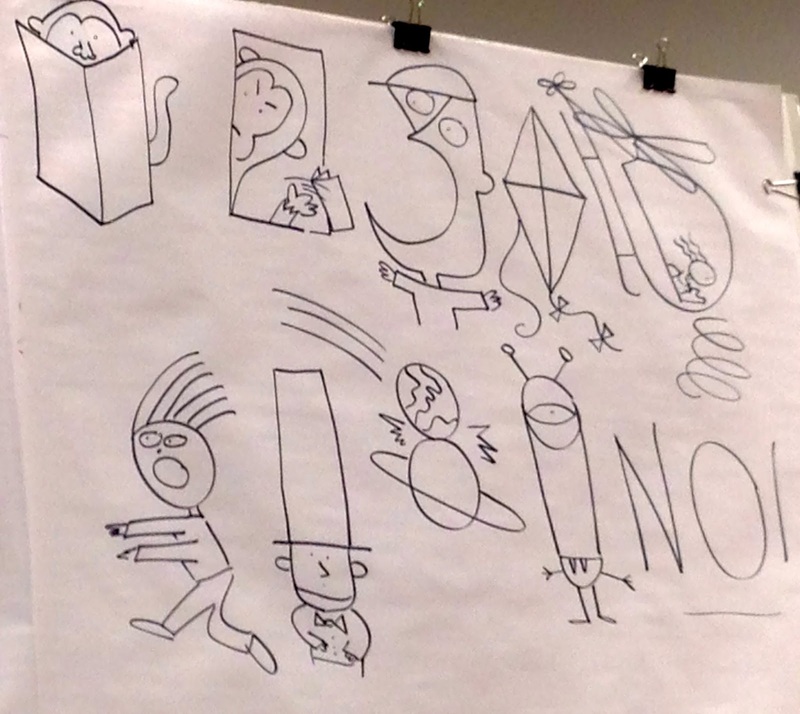 As the teacher tells a story, the class artist (or a different artist for each letter) illustrates on the board. 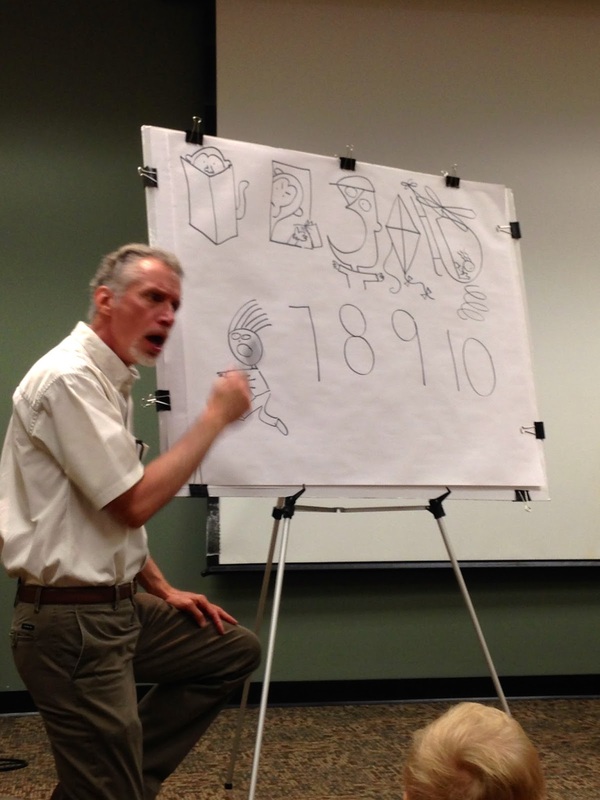 The teacher has a rehearsed set of drawings that they tell and draw out to the class. Have you done something like this? How did it go? 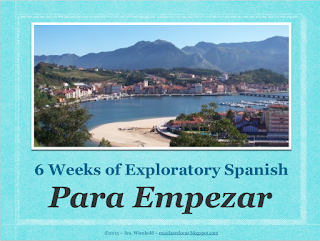 I am pretty excited that next year I will get the chance to teach Jr. High exploratory Spanish for the first time. In fact they do not even start until 2nd trimester in November, and I have already started working on things for them! How it is set up I will have one class everyday for an hour for 6 weeks. 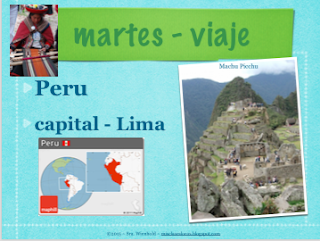 I put together this keynote/powerpoint 6 Weeks of Para Empezar. 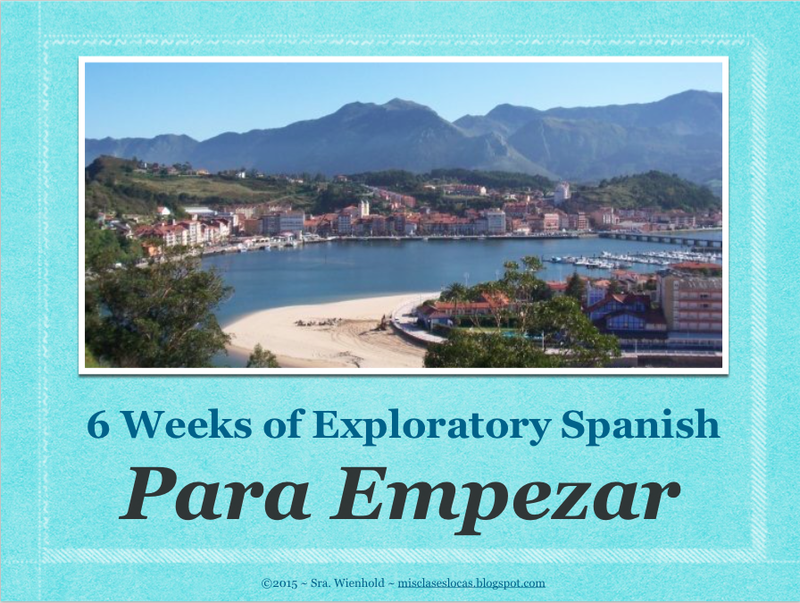 It is similar to my original Para Empezar set up with a specific activity for each day: Monday - Video, Tuesday - Travel, Wednesday - Music, Thursday - Joke & Friday - Dance. I may substitute in free reading time on Tuesdays and Thursdays a little later. 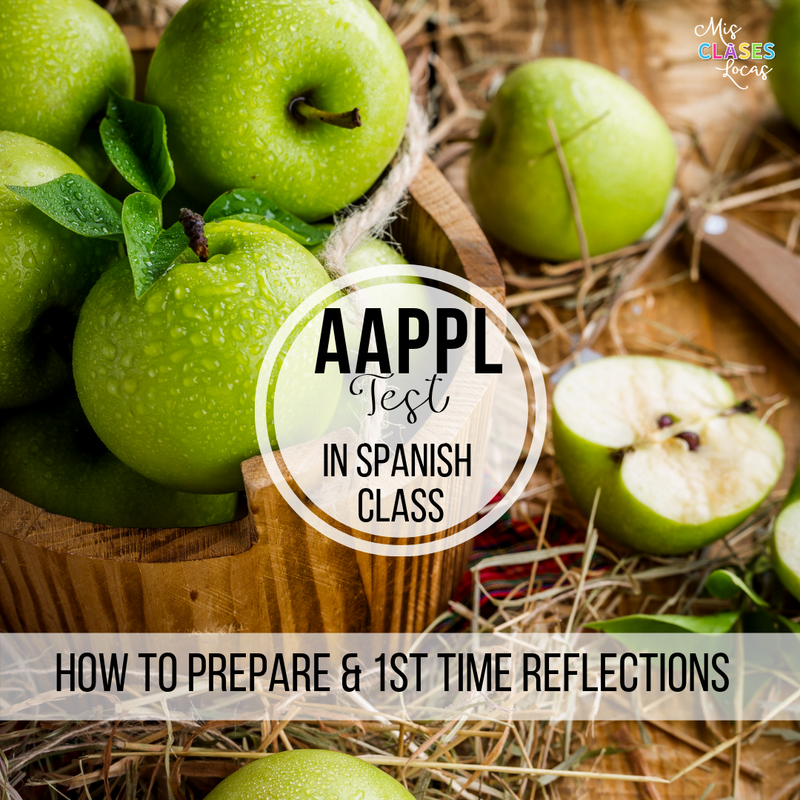 This could also be used to start Spanish 1, or adapted for upper levels. It would be great to leave as a behavior management strategy for a maternity leave substitute. I would love your tips on hooking in junior high students to take Spanish in high school! I was very fortunate to spend three days last week with my new team at the PLC (Professional Learning Community) at Work Institute in St. Charles, MO. I will be honest, I really had no idea what a PLC was when agreeing to go to the conference. I just knew it would be a great way to meet and bond with my new staff. I assumed it was just another acronym of some program we would be implementing during professional development time. I WAS WRONG. 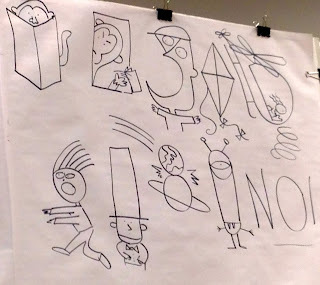 Here are just some of the key things I learned from this great conference. Schools need to move from meeting as a group where the focus is coordinating to being a TEAM where the focus is collaboration. This means the team is interdependent and everyone thinks in terms of “our students” and what can “we do” instead of “my” and “I.” High performing schools have teachers who hold each other accountable. Everyone carries their own weight! The goal for all schools should be for ALL STUDENTS to succeed. When a student fails, we need to stop blaming everyone else such as their parents, their lack of effort and the lack of funding. We need to focus on what WE CAN CONTROL. But, when we KNOW BETTER we have a professional obligation to DO BETTER. If not we are committing educational malpractice. If we know that this grammar worksheet is not best practice, we are at fault by offering it. Once again if the goal is for all students to reach proficiency, why do we put up so many roadblocks to allowing that success? Failure should not be an option, so homework should not be graded, late work should not be penalized, and assessments should be allowed to be retaken to meet the essential standards. We need to stop claiming we are getting students ready for the "real world." There is no research supporting that the more students fail the more responsible they will become...it is quite the opposite. I have been interested in standards based grading for a while and this conference confirmed for me that it is something I need to dig deeper and investigate for use in my class. To reach this success, there must be systems in place to allow for the fact that every child will not learn in the same way or at the same rate. These intervention time must be scheduled in the school day and mandated for those who have not met the essential standards. We can NOT have below grade level tracks for students if we want them to graduate and be successful outside of high school. 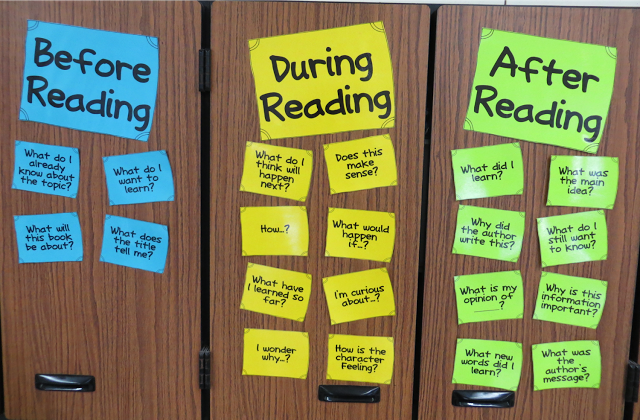 We have to start with the end in mind, meaning what are the "got to know" things that a students should leave your class with? 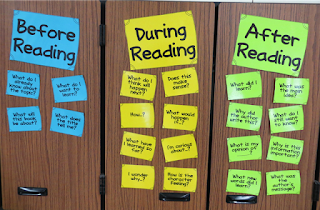 There can be more "nice to know" standards throughout a unit or year, but we have to know the absolute essentials, so we ensure all students leave class with this foundational knowledge. At some point we need to get beyond "we need to cover EVERYTHING" and figure out what is essential, and teach less deeper. TEACH LESS, LEARN MORE. Once we have these standards, we should elaborate in a spreadsheet like this one by Mike Mattos. I plan on using this Google Sheet Template to work on my essential standards for each level. As a #deptof1, this is where I need your help! 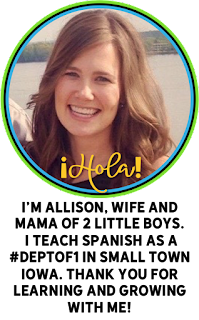 What are your essential pieces of knowledge that students MUST understand before moving on to the next level in Spanish class? If you have a document like this, I would love to see it! Please leave a comment or message with the "got to know" essentials in foreign language class! If you are interested in learning more, you can also check out #atplc on Twitter or this website. 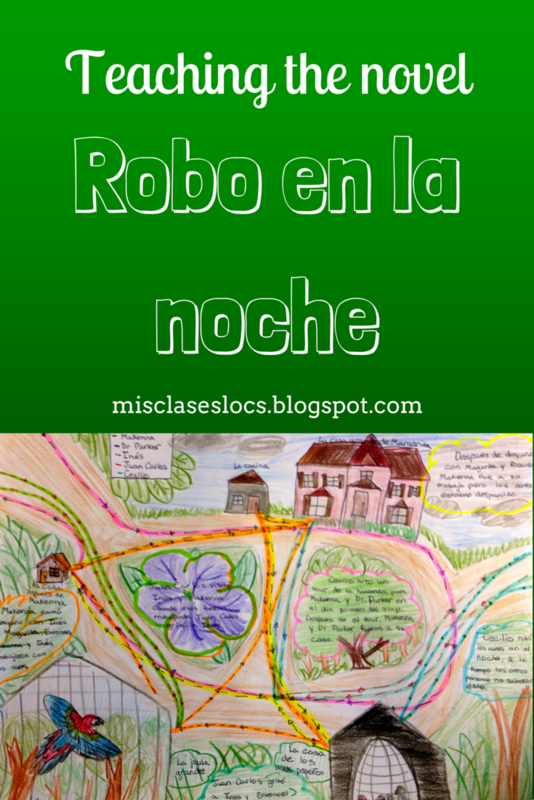 One of the favorite books of the year from Spanish III was Robo en la noche by Kristy Placido. We read it in the past tense as a part of a bigger unit about the environment, and Costa Rica. 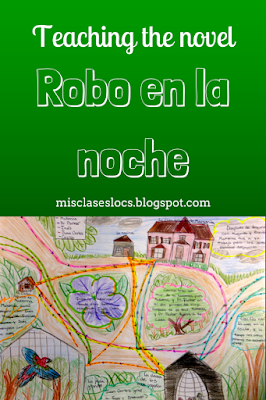 I relied heavily on the Robo en la noche teachers guide. We also actually read the book to start out Spanish IV, as they had never read a novel. 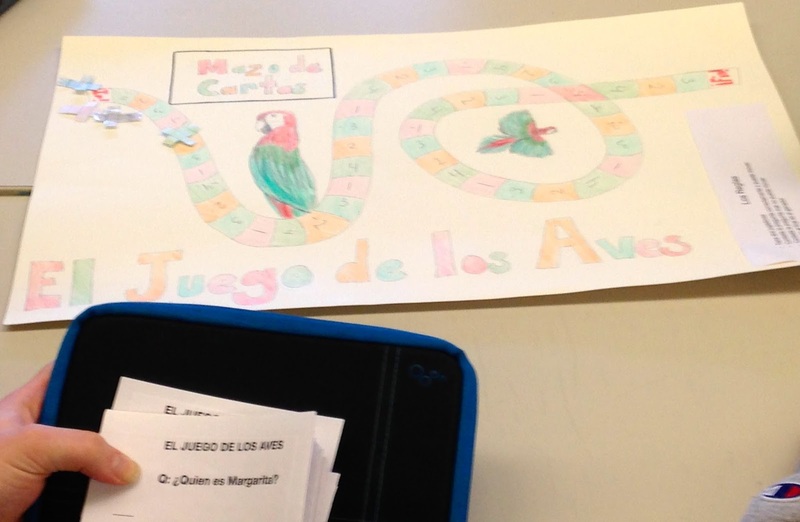 They loved the storyline and although the reading level may have been a bit low for them, it provided a lot of high level discussions and gave them great confidence to go on to read La Calaca Alegre and Cajas de Cartón. We started out the unit completing these stations using realia about the environment in Spanish, modified from the Desafíos Medioambientales Unit shared by Kara Jacobs. We also learned about basic geography of Costa Rica in the target language, as shared by Elizabeth Dentlinger. During the novel we completed many activities from the teachers guide. An especially great resource is having students explore the Costa Rica MINAE website, so they can see this organization actually exists. We also talked about the Escuela de Botellas Peace Corps project. 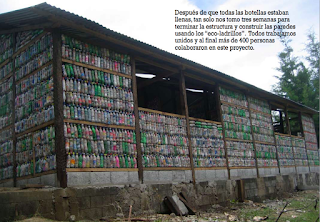 It shows a way to eliminate trash by using it to create a school. This awesome resource used to be an interactive online book that has a recording of a native speaker as you turned the pages. It actually takes place in Guatemala and could be used a part of a unit on Esperanza or schools around the world. 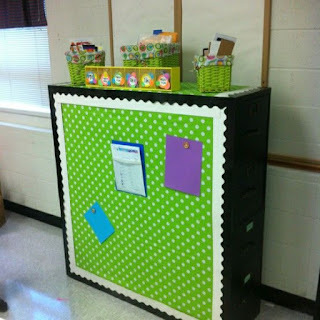 Choice Board based on the one shared by the author Kristy Placido. Some of the projects can be found below. For next year I would like to add a movie to this unit. Any ideas? 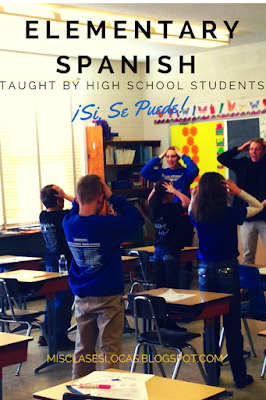 I blogged at the beginning of the school year about having HS students teach elementary Spanish and wanted to reflect on how the lessons this year went. Students had class time to plan and all classes generally covered the same basic topics each week, with variation based on age. This way everyone could plan together and there was more accountability to make sure that all groups were prepared to teach. In the past we tried to cover way too much content and vocabulary in a single class period. For example our topic may have been "food" and we gave them a huge list of Spanish food vocabulary words, and then did some kind of little exercise to practice these words out of context. Could they communicate? NO. Were they retaining it? NO. So as with my classes this year I tried to teach the high schoolers how to incorporate more comprehensible input methods, using just a couple target structures in the elementary lessons. I think it went much better and the elementary students were actually starting to communicate! Since I wanted the high schoolers to succeed, I provided them tried and true resources from experienced teachers (*Martina Bex). I had to remember that these were HIGH SCHOOL students with no formal teaching training, so they need guidance as to how to facilitate a successful lesson. 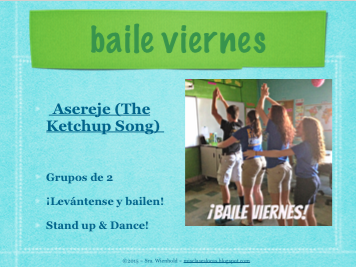 Also, these particular classes LOVES songs, so many week's lesson was centered around a song. Below are some of the resources that we used. Have you tried a program like this? How did it work?